Note: These options require the Blog add-on in GP Premium. 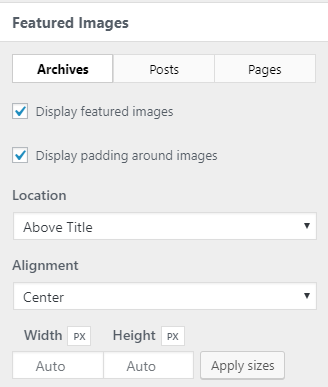 Starting in GP Premium 1.5, the featured images layout options are separated for Archives (blog index, categories, archives and tag pages), Posts (single posts) and Pages (static pages) by using the toggle button. Display featured images – Show or remove the featured images. Display padding around images – Show or remove the padding around featured images (only available when alignment is set to center). Location – Set the location of featured images. The options are below title and above title (single only). Alignment – Set the alignment of featured images. The options are center, left and right. You can use this filter under any conditions you need by using the WordPress conditional tags. The image resizer in GPP tries not to overload your server resources, so it waits until there’s enough resources available to process the images. If you find it taking too long, you can use a plugin like this. Manually run the cron event, and your images will resize.